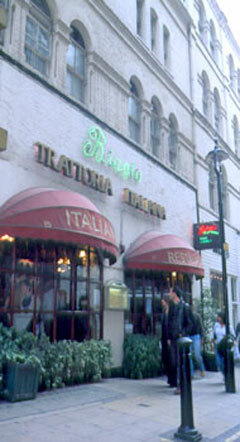 This restaurant was originally opened in 1980, and was the first of what has now become Biagio Restaurant Group. Serving traditional Italian cuisine situated next to Charing Cross Station, and close to Embankment Tube Station, this restaurant has built itself an impeccable reputation for good service and fine food. The décor is traditional Italian with wine bottles, Italian photographs and classic tunes playing in the background all creating a lovely warm atmosphere. Its central location makes this restaurant perfect for pre or post theatre dinner. A maximum of 10 guests are allowed per table. Service is warm and friendly. This informal Italian brasserie is just what you're looking for when it comes to gatherings of friends, birthday parties or business lunches. No private room available, but the entire restaurant can be hired on request and caters for up to 50 guests. The menu includes daily specials as well as the a la carte menu. Reliably fresh pasta, pizzas and well-made Italian classics including starters of prosciutto and melon, pizzas, pastas like traditional lasagne pasticciate, main of veal alla Romana with sage white wine and parma ham. Linger over a bottle of wine and then the superb coffee.